Day 5/ 15 habits Series: Prepare & Get it out there! Today’s encouragement from writer Jeff Goins was to get on with a project and prepare it for publication. But not for next month or next year. Now. Easier said than done! Every creative’s mantra. On the one hand we constantly hear that we should hone our craft, tidy rough edges, work at it, be professional and so on. Now this Goins chap is stirring up a frenzy among writers to get something out there. Straight-away. I can almost hear the wild tapping on thousands of keyboards as writers everywhere try desperately to churn out their book proposals, synopses or movie scripts. I suppose we could all use that push. “Ship and tweak” he says. Sounds like he’s turning writing into some sort of manufacturing plant, where no soon as the last batch of goods has been dispatched, work starts on the next lot. I don’t relate well to machinery in general, so I’ve been finding Day 5’s challenge pretty hard going. It’s true that technology has made it all so much easier to produce work and go back to correct or perfect it. If we keep putting things off, we may never even complete what we’re working on. Right now, I’m in the middle of the final editing process of my project. I would have loved to send it off to a publisher, but it’s just not ready. And I really need to tweak and update the synopsis. For now I’m happy that I’m getting into this blogging habit and that I actually uploaded my previous post and sent it into the Twittersphere before I could change my mind on whether it was good enough. I prepared something and I posted it. I suppose that qualifies. Thoughts, fellow #15habiters? 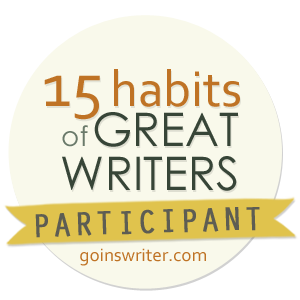 This entry was posted in Habits of Great Writers Series.